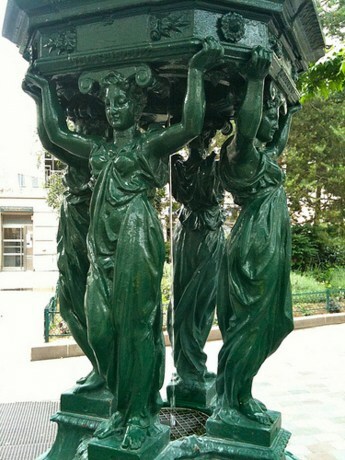 Scattered across the city of Paris, nearly 100 (mostly) green cast-iron fountains provide free water to those who need it. Personally, I fill up at these fountains on a near daily basis in the summer when the heat is relentless and I’m on tour all day. But where did these fountains come from? And why are they called Wallace? It’s not exactly a typical Parisian name. To understand the story of the Wallace Fountains, you have to go back to the 19th century and the devastation of the Franco-Prussian War. The winter of 1870-1871 was a brutal one for Paris. The city was under siege by the Prussian army, and the citizens of Paris were reduced to eating the animals in the zoo to stave off starvation. When the siege ended in January of 1871, the city was in dire straits. In particular, many of the aqueducts that led into Paris had been destroyed, making clean water scarce and very expensive. Those who couldn’t afford water resorted to drinking beer and other forms of alcohol, as these were considerably safer and cheaper options. Fortunately for the city of Paris, philanthropy among the upper classes flourished in the years immediately following the war, and one man in particular took a keen interest in the plight of the city’s supply of drinking water. This man was an English expat named Richard Wallace. Wealthy from a sizeable inheritance from his father, Wallace decided that everyone in Paris deserved access to clean drinking water, regardless of the size of their pocketbooks. To do this, he financed the construction of the 50 original fountains around the city, a number that has since nearly doubled. In honour of their benefactor, these fountains are named after Wallace, and he earned himself the nickname “the most beloved Englishman in France.” Today, to honour his legacy, Wallace is interred at the prestigious Père LaChaise Cemetery in Paris. Have you found one of the Wallace Fountains yet? They are in operation from March-November and the water is safe to drink. Richard Wallace’s vision of free water for all lives on today. Want more FIND ME? Click HERE.